Recently, headlines in Germany and Austria might have made you shiver with fear: “The. EU. Wants. To. Ban. Crispy. Chips”. No less! The same EU which dictates the shape of our bananas and cucumbers is now meddling with our chips. Or is it, asks Monique Goyens. Monique Goyens is director general of the European consumer organisation BEUC. Credit where it’s due: Belgium’s tourism minister was first to spark controversy back in June, when he claimed the EU was threatening Belgian’s “culinary heritage” (a.k.a. frites). Chip lovers everywhere began cursing those Brussels bureaucrats. Let’s be clear, the chips ban is another ‘Euromyth’. The EU has never had the intention of banning any food or culinary tradition – just like it never banned curved bananas and cucumbers. What the EU is trying to do is to protect our health from a cancer-causing chemical called ‘acrylamide’. Acrylamide forms naturally when starchy food (such as potatoes, cereals) is baked, fried or roasted at hot temperature with low moisture. Lab tests have shown acrylamide in the diet causes cancer in animals. Scientists have therefore concluded it potentially increases the cancer risk for people too. In 2015, the EU food safety watchdog EFSA called acrylamide in food a public health concern. Consumers get exposed to this contaminant through industrially-produced food. This includes crisps, bread, biscuits and coffee. You also get this contaminant from home cooking if you cook chips above 175°C or burn your morning toast. The darker your bread or potato after its cooking, the more acrylamide there will be. Health risks from acrylamide in food are nothing new and the food industry has been pledging to reduce this contaminant for years – though it has failed to turn words into deeds. As acrylamide levels were not going down, the European Commission finally took the bull by the horns in the summer of 2016 and put forward a law proposal to oblige food manufacturers to act. The draft law generated heated debate. There were those claiming the measure was going too far, and those – among whom were consumer groups – who wanted it to be beefed up. After months of discussions and a social media frenzy, EU member states finally voted through the acrylamide regulation on 19 July 2017. With the new law, all that food manufacturers, bakeries, restaurants and fast-food chains will have to do is make sure acrylamide levels in the food they sell or serve to consumers remain below ‘benchmarks’ set in the law. Not only are these thresholds unambitious – 85% to 90% of foodstuffs on the market already comply with them – but they are not even binding. In practice, food makers will have to show they strive to bring acrylamide levels down – but with no real obligation to succeed. Concretely, they will need to take steps to minimise acrylamide formation during processing. The list of measures they can choose from include sourcing raw materials that lead to lower acrylamide levels, optimising potatoes storage conditions or keeping frying temperature below 175°C. The list was largely drawn up by industry sectors themselves. As for the small Belgian ‘frietkot’ (i.e. chip shop) around the corner, requirements are even lighter and subject to “compatibility with the desired food product to be obtained”. Chip shop workers will essentially have to keep the frying temperature below 175°C. They will also have to ensure their chips are not too dark by checking them against a colour guide that merely comprises of three different shades. Although it does not go as far as setting binding limits for acrylamide, EU consumer groups have welcomed the new law. At least acrylamide will finally be on all food makers’ radars. They will have to reduce the presence of this carcinogenic substance in their products. But that will only be if it ever sees the light of day. Some members of the European Parliament took aim at what they call the ‘Chip Regulation’ and are now seeking to block it on the grounds it would be way too burdensome for restaurants and chips stalls. 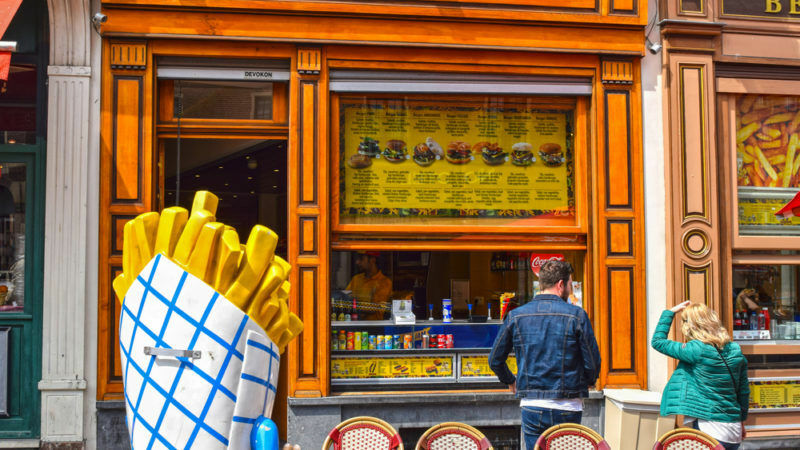 Fancy some chips in Brussels? The good news is preparing chips which are not loaded with acrylamide is nothing complicated. A small-scale survey carried out in Brussels ‘frietkots’ earlier this year found only one in four would need to make extra efforts to bring acrylamide levels below the new benchmarks. Some even achieve very good results and in fact welcomed the new law. Chip advocates among EU parliamentarians should thus rest assured the new law will not deprive them of their favourite dish. What it will do though – provided they do not veto it – is to better protect their health and that of 500 million consumers. And that is exactly what the European Union is there for. So basically there is as yet no research that proves this claim substantively? So why are the eu meddling other than they are just trying to make every decision for us although the eu is not elected, but just a committee of failed politicians called the commission.